From late March to July every year, India comes alive with mango madness. 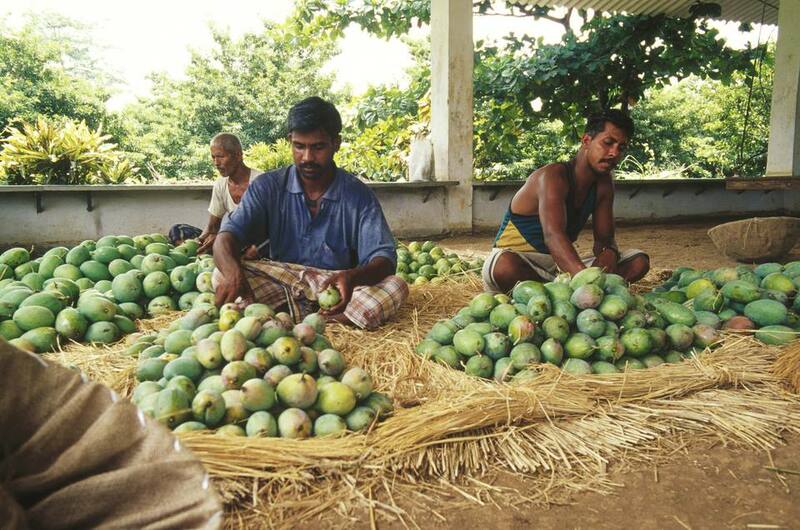 More than 1,000 varieties of mangoes are produced across the country, particularly in the states of Uttar Pradesh, Bihar, Andhra Pradesh, Gujarat, Maharashtra, Goa, Karnataka, Tamil Nadu, Odisha and West Bengal. The mangoes are made into pickles and chutneys, added to curries and desserts, put into drinks, and of course eaten raw. Mango tourism is starting to catch on in Maharashtra, where the popular Alphonso mango (locally known as hapus) is grown. Come mango season and people flock to the Ratnagiri and Sindhudurg districts to feast on fresh mangoes. Mango festivals are also held all over in India in honor of the "King of Fruits". Located at Nate, in the heart of mango country between Ratnagiri and Sindhudurg, Ganesh Agro Tourism has a substantial organic mango farm with more than 2,000 Alphonso mango trees spread over 30 acres. The hilly terrain above the ocean is picturesque and the sunset views are superb. Owner Ganesh Ranade has done an outstanding job of embracing mango tourism. Visitors can go on a safari of the mango farm, learn how the mangoes are grown, and sample them (pick for free and pay per kilogram). Ganesh's wife also operates a canning factory on the property where you can buy delicious mango products such as pickles, amba poli, and mango pulp. Other possible activities include bird watching, boat rides, and bullock cart rides. Or, simply relax in a hammock! Tasty, home-cooked traditional vegetarian cuisine is served. There are five simple but spacious and clean guest rooms. A one-night package costs 3,600 rupees for a couple including all meals, local sightseeing, and farm tour. Visit their website for more information. One of India's top farmstays, Dwarka is a bright and modern place on a 15 acre organic orchard in Maharashtra's Sindhudurg district. It's located in Sawantwadi, approximately 30 minutes drive inland from unspoiled Vengurla beach. The property has more than 200 Alphonso mango trees. Coconuts, cashews, bananas and pineapples are also grown there. There's a dairy as well! When you've had enough of mangoes (if that's possible! ), try local activities such as visiting a pottery village, bamboo workshop, and mat weaving. Room rates start from 3,200 rupees per night for a double. Packages with all meals included are available. Visit their website for more information. This inspiring organic seven-acre farm was started in 2010 by an ex-photographer from Mumbai, who was concerned about the pesticides in food. (Arwa means "pure"). You'll be able to take part in seasonal mango harvesting and gain insight into how the mangoes are naturally grown. A two-day mango festival is held at the farm in early June as well. Highlights are a special mango-based lunch, interactive talk, and visit to the mango plantation. The property is situated a two and a half hours from Mumbai. It's ideally visited on a day trip but it's possible to stay there overnight. Expect to pay 1,800 rupees per person, including breakfast. Swadesee conducts a day tour to the mango festival. Oceano Pearl is a boutique homestay that's situated on a mango and coconut grove fronting an untouched stretch of beach at Ganeshgule, south of Ratnagiri town. During mango season, you'll be served fresh Alphonso mangoes and a huge variety of mango dishes as part of every meal. It's also possible to go mango picking at a local orchard. Four categories of rooms are offered, with rates starting from 3,800 rupees per night (from mid-April to mid-June). There's a luxury air-conditioned tree house, only a few minutes from the beach, priced at 4,900 rupees per night. Breakfast is included. Visit their website for more information. Pune-based The Western Routes usually conducts a two-night Mango Picking and Tasting Tour in May, staying at Oceano Pearl (to be announced for 2019). Closer to Mumbai, Sankalp Farms has a gorgeous setting overlooking Andra Lake at the foothills of the Western Ghat mountains, off the Mumbai-Pune Expressway. The property is spread over a massive 170 acres and fronts the water. There are 10,000 mango trees (and thousands of cashew and guava trees), with Kesar being the predominant variety. However, Alphonso is also grown, along with exotic mangoes such as Vanraaj, Amrapali, Mallika, Sindhu, Ratna and Pairi. It's perfect for a day trip, where you can learn about organic mango farming and get some yummy mango recipes. Visit their website for more information, or phone (022) 28401815. Conveniently located only an hour and a half from Bangalore, Chiguru Farm occupies 25 acres of organic farmland on the fringes of Bilikal Forest, south of Bannerghatta National Park. It's an attractive property with a variety of fruit trees, including Badami mangoes. Tours are conducted during the mango harvest season from April to June. You'll be taken on a guided walk around the farm and encouraged to pluck your own mangoes to take home (pay for what you pick), as well as served delicious traditional rural Karnataka cuisine. Rustic accommodations, with shared bathrooms, are available on the property for anyone who would like to stay overnight and enjoy rural life. Visit their website for more information. The extensive mango orchards of Kailash Farms are situated around seven hours north of Delhi, at the foothills of the Shivalik range in Punjab. The welcoming owners recently ventured into farm tourism, and they've built attractive guest rooms and cottages amid the mango trees on their sprawling property. Orchard walks and bicycle rides through the orchards, fruit picking, and tractor rides are all offered. There's even a swimming pool! A perfect family getaway among nature, the kids will never be bored. Rates start from 5,800 rupees per night, including breakfast and farm activities. Visit their website for more information. If you can't make it south to Maharashtra, don't despair. Baghaan Orchard Retreat has 25 luxury cottages on a mango orchard about two hours from Delhi. This activity-based retreat is surrounded by farmland. Facilities include kids' play area, games room, and swimming pool, Apart from mangoes, guests partake in adventure activities such as paint ball and rappelling, cycling, horse riding, bullock cart ride, or learn pottery. One-night packages, costing 8,000 rupees plus tax for a double, are offered. Visit their website for more information. This delicious mango festival was started in 2013 by female mango grower Jyotsana Kaur Habibullah at her mango orchard. The aim was to promote the region's mangoes, and support small farmers and women in agriculture. The festival has since grown into a large event that takes place over three days. It includes orchard visits, mango food festival, farmers' market, cultural events, and a seminar. The finest mangoes are available for sampling and purchase direct from the farmers at the festival. There are also delicious mango delicacies, mango eating contests, and plenty of children's activities. Food at the festival is cooked by locals in the village. Folk music and dancers will entertain the crowd under the mango trees. Where: Orchard Malihabad near Lucknow, and Indira Gandhi Pratishthan in Lucknow. People in Delhi can get their fill of mangoes at the annual International Mango Festival organized by Delhi Tourism. This renowned festival started way back in 1988 at the orchards in Saharanpur. It expanded to Talkatora Stadium in 1991 and then shifted to its present location at Dilli Haat in 2010. An astonishing 500 varieties of mangoes from all over India are on display and available for trying. You'll be surprised how different each tastes! Visitors can also purchase mangoes, mango products, and mango trees. Other activities include mango eating competitions, quizzes, magic shows, and cultural performances. When: Early July. Dates to be announced. Where: Dilli Haat, Janakpuri. A free shuttle service is provided from Tilak Nagar Metro station to Dilli Haat. The 28th annual Mango Mela, organized by Haryana Tourism and the Horticulture Department, promises to be a fun-filled festival with hundreds of varieties available for sampling. Those who have a vast appetite for the King of Fruits can also participate in the mango eating competition. There will be mango quiz competitions, cultural performances, a handicrafts market, and food court too. Where: Yadavindra Gardens, Pinjore, near Chandigarh. A highlight of the year, the annual Mango Mela provides a platform for farmers to sell their organic, naturally-ripened (without the use of calcium carbide) produce directly to consumers. Some of the varieties available are Mallika, Dasheri, Amrapali, Malgova, Raspuri, Sendura, Totapuri, Sakkare Gutti, Chinna Rasa, Banginapalli, Kesar and the unusual Sugar Baby. The festival is jointly organized by the Department of Horticulture and the Karnataka State Mango Development Marketing Corporation Limited. When: May or early June. Dates to be announced. Where: Lalbagh, Bangalore. Curzon Park, Mysore. About 400 varieties of mangoes are grown in West Bengal and you'll be able to try about 100 of them at this three-day mango festival. The festival is an initiative of the Food Processing and Horticulture department to showcase the state's mango production. It features an exhibition of mangoes and mango products, mango cooking competition, and other mango-related activities. When: Early June. Dates to be announced. Where: New Town Mela Grounds, Kolkata.